A large 300 m2, 3 bed room, 3 bath room Duplex Villa on the 1st line of Hadaba Sea Street, Sharm el Sheikh. 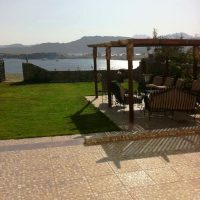 With a large garden & swimming pool commanding uninterrupted views of the Red Sea, Tiran Island and beyond. American style fitted kitchen and large bathrooms with large walk in showers plus fixtures and fittings to match the glamour of this property. Furnished and decorated to an extremely high standard this property has to be seen. Situated on Hadaba Sea street this property is close enough to be able to enjoy all that Sharm el Sheikh has to offer, yet far enough away from the hustle and bustle of the city to offer a peaceful, quite and tranquil area in which to relax and enjoy your life. This Ad has been viewed 121 times and got 1 reply.